1 Master w/Queen, 1 w/King, 1 w/Queen and Twin, 1 w/ Queen, 1 w/Bunk Set. Guest Linen Option. 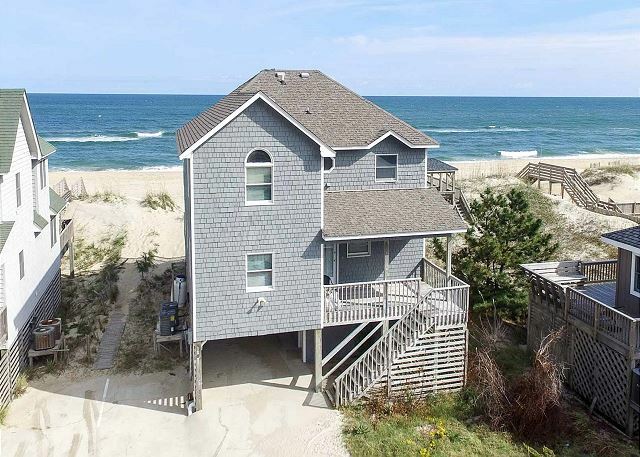 This delightful oceanfront home offers classic Nags Head style accommodations with fantastic ocean views. You are on vacation so put your feet up and unwind on one of two large oceanfront decks. Enjoy the deck furniture, chairs and side tables that make this the ideal spot to experience splendid views of the Atlantic Ocean. This retreat is also pet friendly so make sure you pack a bag for your four legged loved one as well! All TVs in house are flatscreens. Come enjoy the perfect location and fresh new look! The 8 person Hot Tub will complete your day at the beach, leaving you relaxed and ready for another great Outer Banks adventure. Internet access is available so you can stay in touch with family and friends back home and tell them all about your amazing days! All Flat Screen TV's. You will find that you are located near great shopping and dining while away from the hustle and bustle of the main roads. 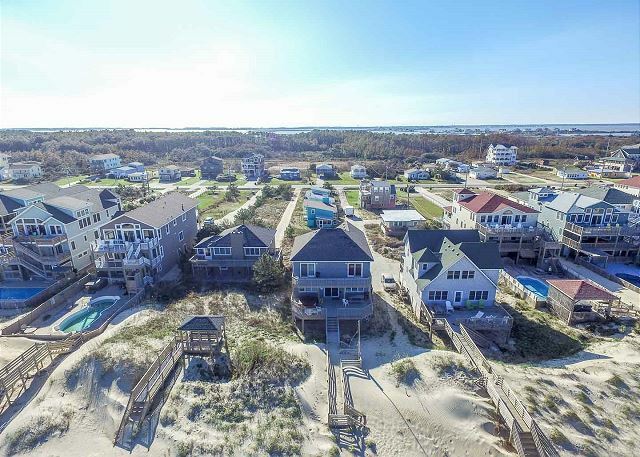 With close proximity to Jennette’s Pier and the Bodie Island Light House, your family will have a myriad of activities to choose from each day. Lower Level: Bedroom w/Bunk Bed, Half Bath, Sitting Area w/TV. Mid Level: Bedroom w/Queen Bed and shared Bath. Living Room, Dining Area, Kitchen, Deck Access. Upper Level: Master Bedroom w/Queen Bed. King Bedroom that shares Bathroom w/Queen Bedroom, Access to Upper Deck. 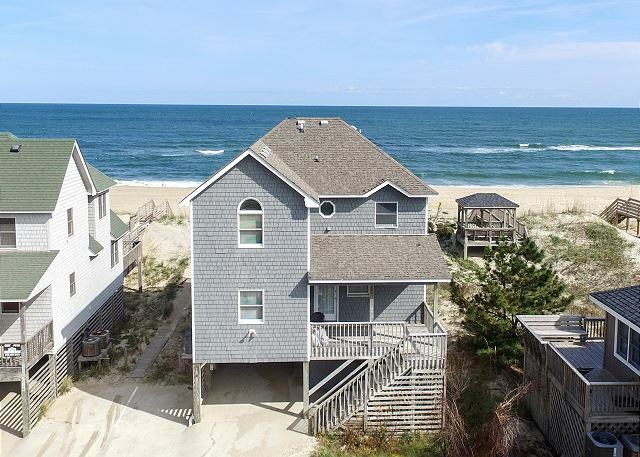 Nags Head, NC is getting More Beach To Love. 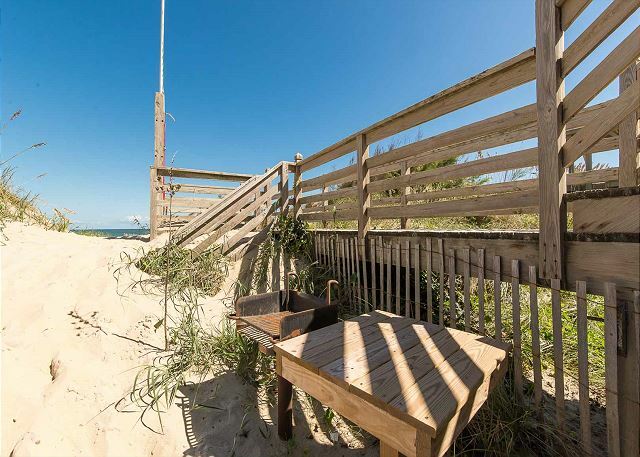 The Town of Nags Head will be conducting a beach nourishment project starting in May 2019 and lasting possibly into Fall 2019. For more information, please visit the Town of Nags Head website. The views where amazing as was the weather. Thank you for your review! We are so glad you enjoyed the home, and your stay! We hope to see you again soon! Too short! Thanks hurricane Florence! Found the rental to be very clean and liked the fact that the main living space was on the second floor with a easy walk out the deck to the beach. Other rentals had the main area on the top level which was a lot of climbing up and down stairs. Staff was attentive to our reservations even before our arrival. They called to make sure that we received the keyless entry code a few days before our arrival and called to welcome our family to the beach a few days after check-in. Jennifer, thank you for you kind words! We are glad that you are satisfied with our staff! We hope to see you again soon! Accurate property description, clean & well maintained, good customer service. would recommend.Closeness to beach a plus. Ocean difficult to navigate due to waves breaking right at shore. Having our pets important. The vacation could not have been any better!we have never had a rental property this clean. The staff was excellent. Response time was great. We have been staying in Nags Head since 1984. Our best experience ever. We have used other rental companies,. We will recommend Beach Reality. Francesca, thank you so much for sharing your experience with us! We are so glad that you had a great time! We appreciate your recommendation, and we hope to see you again soon! The cottage was well maintained, clean, and well equipped kitchen. The view was spectacular! 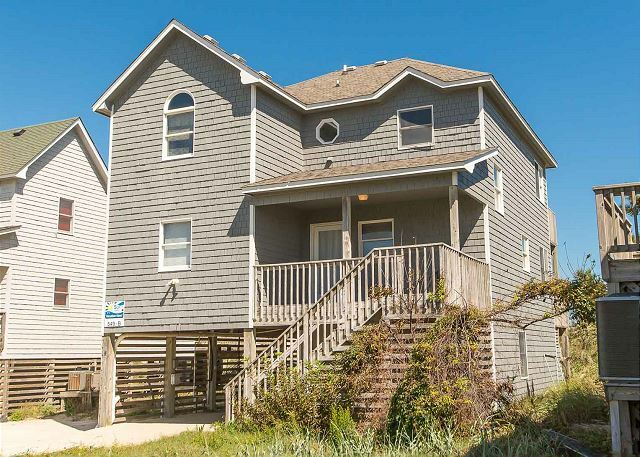 Located in South Nags Head the beach wasn't crowded and close to places to get groceries, shop and dine. The walk to the beach was short. The rental staff was friendly and helpful. Would definitely rent this cottage again. The only thing I would add would be an extra trash can. Betty, thank you so much for taking the time to share your experience with us! We are so glad that you had a great week! We will pass the feedback to the owner. We hope to see you again soon! Loved being right on the beach with a great view from both decks and even the kitchen table. In walking distance to two piers. Place was very comfortable and clean. Pots and pans had seen better days but we had everything we needed. The king master bed was not comfortable (maybe a thick mattress pad and better sheets would help until it can be replaced). Need to be careful coming back the driveway, some major potholes in concrete. Place was very clean except the furnace, we turned on the heat one evening but quickly turned back off because of burning dust smell.